MicroStrategy unveiled the Intelligent Enterprise map at its annual user conference taking place in Las Vegas this week. The map is designed to put organizations on the path of a successful data-driven future. It provides a playbook of technology combined with techniques organizations can take advantage of when planning their analytics initiatives. 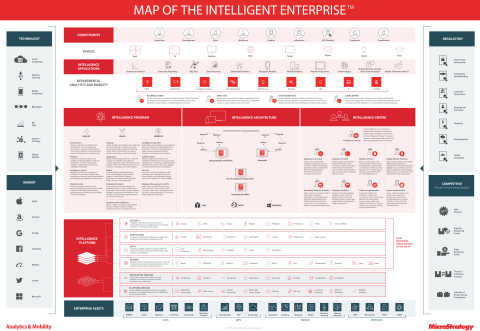 According to the map, an Intelligent Enterprise should include platform services to deploy analytics, application services to integrate solutions into apps, reusable schema to map complexities around data, federated and certified data for developers, analyst and data scientists to leverage, applications that are containerized, packaged and published to the enterprise, and security capabilities such as multi-factor, multi-layer authentication. In addition, the company reveals Intelligent Enterprise should implement a architecture that supports ad-hoc and departmental analytics, a center comprised of experts, and a program that consists of enterprise best practices. “Nearly every organization wants one set of information that its employees can easily access and trust. The map of Intelligent Enterprise gives organizations the knowledge and insight they need to make that a reality,” said Tim Lang, senior executive vice president and CTO for MicroStrategy.